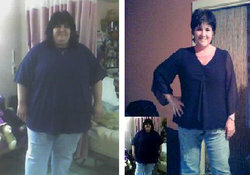 Armsofurangel is this week’s Success Story. 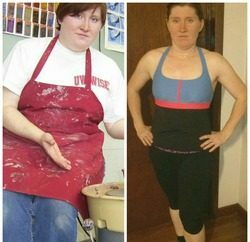 She has lost an astounding 206 lbs by educating herself on nutrition and incorporating a daily exercise routine. The biggest thing for me that made me change my life was healing from within. Without becoming healthy emotionally I could not have become healthy physically. I did not weigh over 400lbs because I was healthy and happy. Everything! NutriSystem, Weight Watchers, Opti-Fast, medically supervised plans, diet pills and shakes. I changed the way I look at food and nutrition. I incorporated a daily exercise program consisting of cardio 6 days a week and circuit training 3-4 times a week. I cut my carbs tremendously and stopped eating white flour products, such as bread. I log all of my foods, eat 6 small meals a day, take vitamins and eat a lot of protein and fiber. My most important change was to come to a realization that this journey is a “way of life” and not a quick fix to lose weight. I have accepted this as my NEW WAY OF LIFE! It helped me to realize how all the calories add up. The constant temptation out there, and also the plateaus that occur when you have so much weight to lose. I have learned to just work through them and never give up! Since I started at over 400lbs it took me about 50 to 70 lbs to see noticeable results. I see every small step as a small success. There is no failure involved when you are working hard and doing the best you can. I have learned to forgive myself for my mistakes and not to punish myself. I am active, I feel confident, I can fit into places and spaces I never could, and I can shop for normal size clothes. But most importantly I can look into the mirror and recognize the woman looking back at me and feel proud. Work on your emotional health, learn about the why’s and the how’s that got you to where you are, and learn the tools to begin the healing. Educate yourself!! Learn about nutrition and which foods are important to lose weight and be healthy. Incorporate exercise into your life. It makes a huge difference! Take baby steps and believe that it gets easier with time. Have a support network and use it! Forgive yourself, love yourself, and be proud of your accomplishments!